the generous portion which she inherited from her Danish ancestry. Denmark is located geographically south of Norway and south southwest of Sweden. area 250 miles east to west, and 225 miles north to south. Denmark is made up of small productive farms, gently rolling hills, but no mountains. little spire in the center of the building which was surrounded by several office buildings. time to time until his retirement or discharge. By the early 1720's Niels had moved out of Sorgenfri into the nearby town of Lyngby. settled in Lyngby rather than continue to follow the count around the country. Langelaender died in 1740 leaving a third wife to inherit his estate. 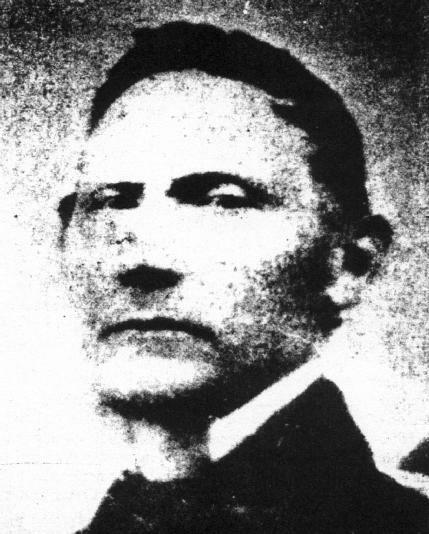 Mathias Nielsen married for the first time when he was about twenty-five years old. after the birth of her second baby. widowed three times. He had been given ten children: only five of them were living. were ages sixteen and twelve. They must have been a great comfort and help to him. evidenced by his appearance at so many christenings. with her as they seem to disappear out of Kongens-Lyngby parish about that time. tradition, but there is not as yet any evidence to support the claim. 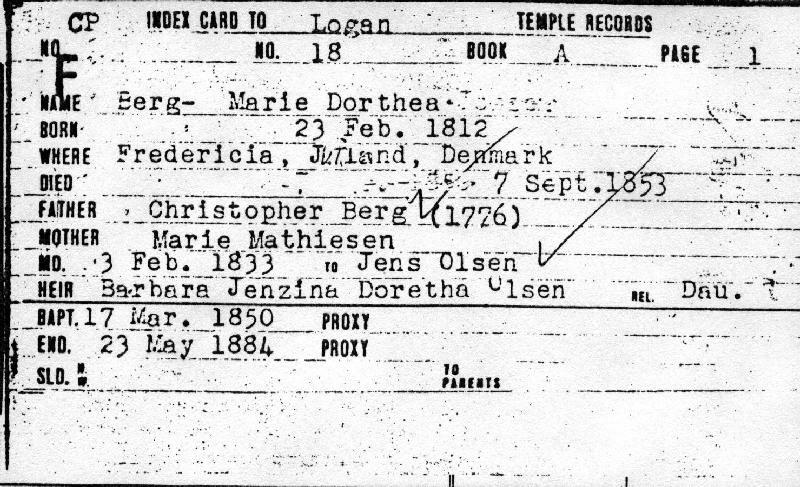 At the christening of Christopher Berg, his father's occupation was given as servant. would have been called a gentleman's servant. location in Copenhagen. He had taken employment as a porter in Almindeligt Hospital. fifty-seven years old at the birth of his last child. family. Christopher and Maria were living in Trinitatis parish in Copenhagen at that time. Kongens-Lyngby whose father was Mathias Nielsen Langelaender. been much loved by her older brothers and by her parents. ten years there until her death in September 1851 at the age of seventy-nine. to establish a branch of the Church. September 1853, just three years after she had joined the Church. Dithlev Mathias Berg, 32, master joiner. Ane Magrethe, 27, his wife. Peder Christopher, 2, their son. Marie Berg, 63, widov, his mother. Christopher Berg, 19, single, journeyman joiner. Jens Nicolai Berg, 16, apprentice. Else Marie Nielsdatter, 40, single, laborer. Halvor Peter Petersen, 19, single, her son [Else Marie], journeyman weaver. Ellen Sophie Petersen, 14, her daughter. Gabriel Mouritz Petersen, 11, her son. Joseph Petersen, 6, her son. Marie Kierstine, 4, her daughter. Jens Olsen, 33, master tailor. Asbjoern Andersen, 21, single, apprentice tailor. Ole Nielsen, 17, single, apprentice tailor. Ane Catherine Larsen, 20, single, servent. Maren Mathiasen, widov, born in Lyngby-Copengagen, 73 yo, living at the hospital. Jens Olesen, 44, Frederiksstad, master tailor. Marie Berg, 37, Fredericia, wife. Jens Olesen, 49, Norway, master tailor. Julie, 17, Aalborg, daughter and housekeeper. Guddi Elias, 11, Aalborg, child. It's very interesting that 'fine' people like the city bailiff was listed among the sponsers. good idea to check the sponsers at the other childrens birth. trace. Unfortunately the record only had a date and it was shortly after the birth. Apr 1833 and christened 23 Jun 1833. Vaccinated 23 Jun 1833. Maiden name Berg. Wife of master tailor Olsen in Adelgade. Mormon. Died 40. Son of master tailor Jens Olesen and wife Marie Dorothea Berg in Skolegade. Sponsers: baker H. Ravnkilde's wife, Miss Groennerup, master tailor Nyeborg, P.
Stidsgaard, master baker Harhorn, all from Aalborg. Woelfferdt, grocer Schjoerring and head clerk Nissen, all from Aalborg. Son of master tailor Jens Olesen and wife Marie Dorothea Bergh in Adelgade. Castannie, miss Galster, grocer Qvist, Printer Berg and joiner Holm. 1826 but not listed in Aalborg records. Master joiner Christopher Berg, 48 yo.